Once in a blue moon are we graced with volunteers like Maria Garcia. The University of Minnesota graduate is a chemist and chemical engineer. She’s also multi-faceted–she balanced her engineering course work with singing soprano in the campus choir and found time to master both French and Spanish. Maria walked into the world of 826michigan this January, but she’s undoubtedly left her mark. While we shared but a few months with Maria, she has blown us away with her wonderful, warm laugh and her thoughtful and cheerful nature. Not only is Maria a dream to work with, but she’s taken on a record number of weekly store shifts (three or more!) at Liberty Street Robot Supply & Repair shop. Everyone who’s shopped there can’t help but notice the friendly and helpful Maria at the desk–greeting folks, answering the phone, and working on additional projects, like transcribing interviews for our Young Authors Book Project. 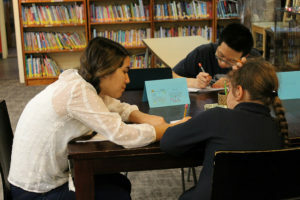 Students are consistently happy to see her and excited to work with her when she comes in to tutor them in the evening. We’ve seen Maria in action, and she makes keeping a student engaged and interested in their work look totally effortless. One of the most endearing moments for us was finding notes from students that expressed sentiments like “Maria is my favorite tutor” and “Maria is the best!” Students often form special bonds with tutors, but Maria has captured the hearts of so many students in a short amount of time. 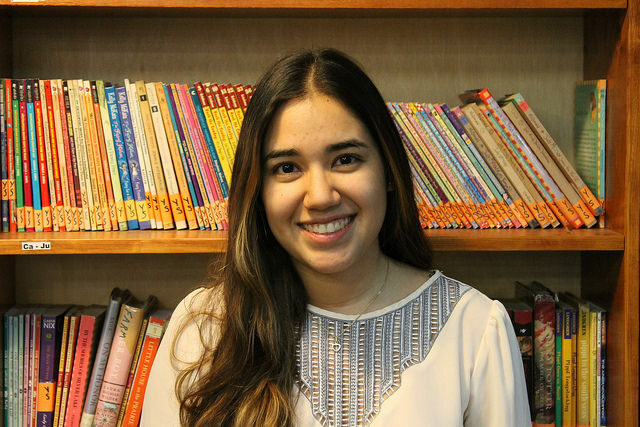 Maria taught kindergarten for a year in Bogota, Colombia, so it came as no surprise that she joined us for our Family Writing Lab at Estabrook Elementary and worked with our young learners so compassionately. Many of the families who attended spoke primarily in Spanish and Maria was able to help make sure families felt comfortable and understood throughout the event. Believe it or not, even in the middle of job interviews and holding down a day job as a chemist, Maria found the time to give us additional support in our field trip program and our in-school projects. Maria is getting ready to start a job in Philadelphia and we’re so thankful that she decided to use her time until then to make an incredible difference in the lives of 826michigan students and staff. We will miss her deeply when she leaves, but are so grateful to have gotten the chance to know her. Even though she’ll be on the East Coast, Maria will still be a part of the 826michigan family, inspiring new volunteers with her appearances in our new volunteer recruitment video (be on the lookout for this soon!). Maria gave such powerful answers that will surely help us to recruit a new swath of interested folks.